A book in the 6th Bamum script, c. 1910. 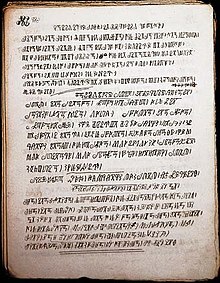 The Bamum scripts are an evolutionary series of six scripts created for the Bamum language by King Njoya of Cameroon at the turn of the 19th century. They are notable for evolving from a pictographic system to a partially alphabetic syllabic script in the space of 14 years, from 1896 to 1910. Bamum type was cast in 1918, but the script fell into disuse around 1931. A project began around 2007 to revive the Bamum script. In its initial form, Bamum script was a pictographic mnemonic aid (proto-writing) of 500 to 600 characters. As Njoya revised the script, he introduced logograms (word symbols). The sixth version, completed by 1910, is a syllabary with 80 characters. It is also called a-ka-u-ku after its first four characters. The version in use by 1906 was called mbima. The script was further refined in 1918, when Njoya had copper sorts cast for printing. The script fell into disuse in 1931 with the exile of Njoya to Yaoundé, Cameroon. The second system, called Mbima ("mixed"), was developed in 1899–1900. It was a simplification of the first; Njoya omitted 72 characters but added 45 new ones. The writing direction was left-to-right in this and all subsequent phases. The third system, called Nyi Nyi Nfa' after its first three characters, was developed around 1902. This simplification omitted 56 characters, leaving 371 and 10 digits. Njoya used this system to write his History of the Bamun People and in correspondence with his mother. The fourth system, called Rii Nyi Nsha Mfw' after its first four characters, was developed around 1907–1908. It has 285 characters and 10 digits and is a further simplification of the previous version. The fifth system, called Rii Nyi Mfw' Men, was also developed around 1907–1908. It has 195 characters and 10 digits and was used for a Bible translation. These first five systems are closely related: All were progressively simplified pictographic protowriting with logographic elements. The sixth system, called A Ka U Ku after its first four characters, was developed around 1910. It has 82 characters and 10 numbers. This phase marks a shift to a full syllabic writing system able to distinguish 160 syllables. It was used to record births, marriages, deaths, and court rulings. The seventh and final system, called Mfemfe ("new") or A Ka U Ku Mfemfe, was developed around 1918. It has only 80 characters, ten of which double as both syllables and digits. Like the previous system, missing syllables are written using combinations of similar syllables plus the desired vowel, or with a diacritic. The script has distinctive punctuation, including a 'capitalization' mark (nʒɛmli), visually similar to an inverted question mark, for proper names, and a decimal system of ten digits; the old glyph for ten has been refashioned as a zero. changes the meaning of a word . Historically, ꛯ was used for ten but was changed to zero when decimal mathematics were introduced. Historical stages of Bamum script were added to Unicode in October, 2010 with the release of version 6.0. These are encoded in the Bamum Supplement block as U+16800–U+16A3F. The various stages of script development are dubbed "Phase-A" to "Phase-E". The character names note the last phase in which they appear. For example, U+168EE 森 BAMUM LETTER PHASE-C PIN is attested through Phase C but not in Phase D.
^ a b Riley, Charles (2007-01-19). "L2/07-023: Towards the Encoding of the Bamum Script in the UCS" (PDF). ^ a b c d e Everson, Michael; Riley, Charles; Tuchscherer, Konrad (2008-10-14). "L2/08-350: Proposal to encode modern Bamum in the BMP" (PDF). ^ "Chapter 19: Africa, Bamum". The Unicode Standard, Version 10.0 (PDF). Mountain View, CA: Unicode, Inc. July 2017. ISBN 978-1-936213-16-0. This page was last edited on 26 March 2019, at 01:09 (UTC).